Find the Bridal Gown of Your Dreams that is perfect for your body type! Let Catherine's Bridal Boutique Help You Choose! 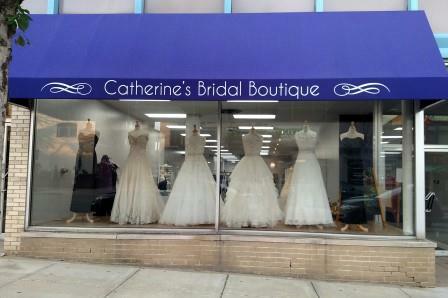 At Catherine's Bridal Boutique, our goal is to help you find the right gown for you. It is a our pleasure to guide you through this very exciting journey. Whether you have just started the process or have already tried on countless gowns, we can take you from where you are, to your final destination ~ the look that is uniquely you! One of the best ways to prepare to shop for your bridal gown is to determine your body type (shape). By doing this, you will be able to focus on the gown silhouettes that will look best on you. Bring photos (or have your Pinterest account ready) of gowns that you are drawn to. This will help your consultant understand your vision and guide you to the right styles. This small step gets the appointment moving in the right direction. Invite only two or three people along. Too many opinions cause confusion. If there are an entourage of people that you want to involve in the process, narrow down the choices with a small group of trusted friends or family first. Then, once you are ready to decide between two or three styles, bring everyone along for the final decision. Keep an open mind, trust the consultant. More than half the time, the "perfect" dress ends up being one that the bride never thought she would choose. That is the benefit of shopping with experienced consultants, who can help you navigate and assess all of your options. Remember, very few gowns look great on the hanger!